The Haiku Year-in-Review: It’s a review, it’s a collaborative grab-bag, it’s a panoply of voices and visions…. 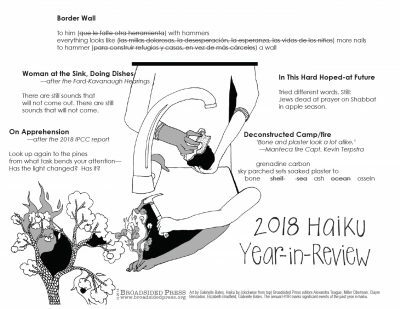 it’s the Broadsided Press annual Haiku Year-In-Review (henceforth referred to as the HYIR). 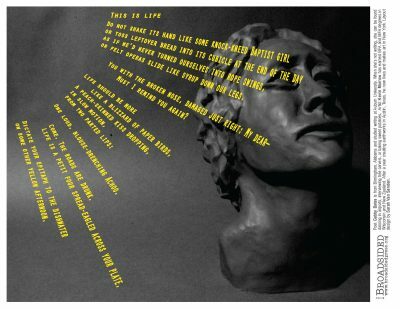 The purpose: to examine, commemorate, and honor the past year in poetry and art. We took inspiration for the HYIR from the tradition of the Carrier’s Address, in which United States newspapers of the 1700s – 1800s would send their subscribers broadsides on the first of the year, ostensibly written by the paper carriers, giving New Year’s wishes, encapsulating the past year’s events, and gently reminding subscribers to thank their underpaid paper-deliverers. This year, after a hiatus, the editors of Broadsided Press have come together to offer a brief overview of 2018—we hope that 2019’s HYIR is much more celebratory.